STOUGHTON, Mass. – The Stoughton Black Knights have been itching to break out offensively. Through four games, the chances have been there but the finish has been missing. 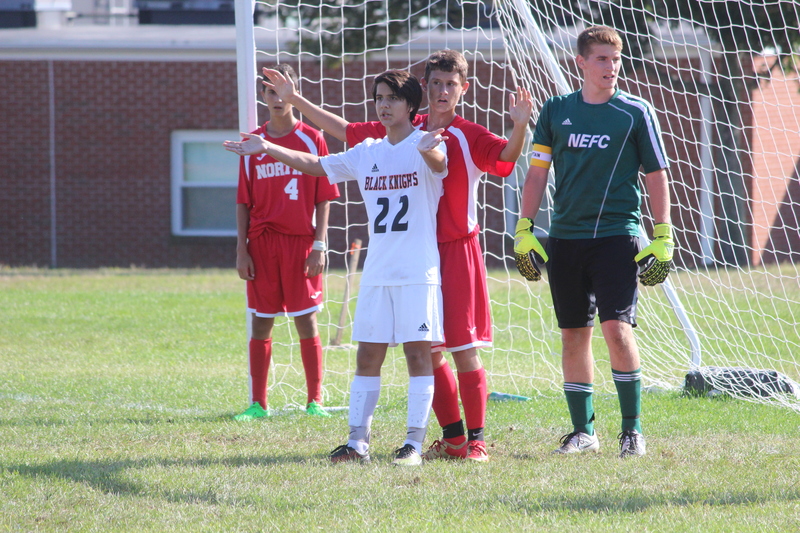 That changed in a hurry on Tuesday afternoon as Stoughton netted the opening inside the first two minutes, doubled its lead before the halfway mark of the first half and added four more goals in the second half in 6-2 win over Milford. Stoughton caught Milford off guard to start the game, with goalie Matt Gallagher’s clearance eventually bouncing into the area. Senior Jordan Asnes took a touch was given time and space, allowing him to despot his left footed shot into the net for a quick 1-0 lead, just 75 seconds in. Asnes had another chance with a shot from the top of the 18 and Marco Antunes had his low cross picked off, both inside the first 10 minutes. Five minutes later, the Black Knights broke through. Antunes corner to the far post was batted around between multiple players before falling to the feet of Marcio Dos Santos inside the six and the junior made no mistake, using the outside of his right foot to find the back of the net. Milford found the back of the net for the first time in the 35th minute. Left back Lucas Caetano delivered a through ball that Pedro Sampaio ran onto. Sampaio cut across the face of goal but was ruled to have been fouled before he could get a shot off, earning a penalty kick. Sampaio calmly finished, tucking his shot into the low left corner to make it 2-1 just before half. Stoughton quickly found its groove again to start the second half. 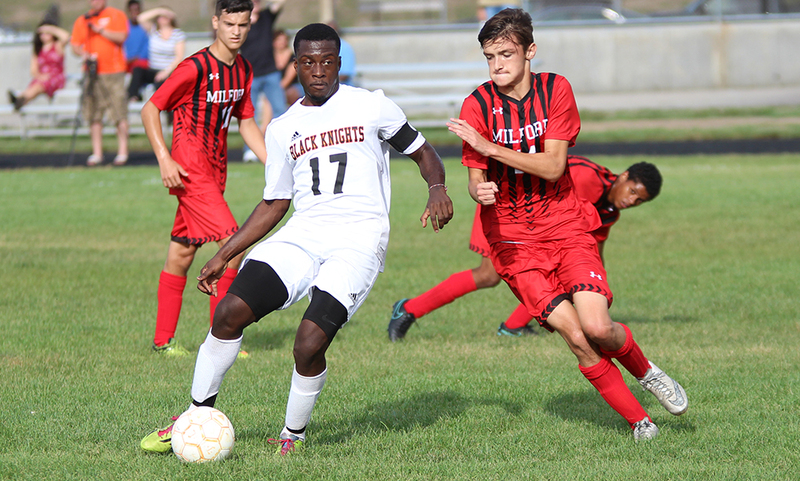 Inside the first three minutes, the Black Knights earned a corner that Antunes drove to the near post. Dos Santos had his bid stopped on a nice save from Luke Capobianco but Stoughton senior Loubensky Lucas pounced on the rebound to make it 3-1. The Black Knights’ offense rolled from there. In the 50th minute, Lucas dropped one over the drop that Asnes took possession of inside the area and again finished at the back post for a 4-1 advantage. Five minutes later, Goddy Fombe made a nice run from the back, finding Lucas, who used a class turn to get free and was taken down from behind, earning a penalty. Lucas took the penalty himself, going low to his right for a 5-1 lead. Stoughton capped its scoring just one minute later in the 15th minute when a service bounced off a defender and Asnes hit it first time to complete the hat trick. Salter also had praise for Antunes, who was dominant in his spot on the right wing and was responsible in creating the majority of Stoughton’s chances. Milford grabbed a second goal in the 60th minute as Tiago Carvalho’s corner kick found an open Marcelo Panno in the area for a tap in. 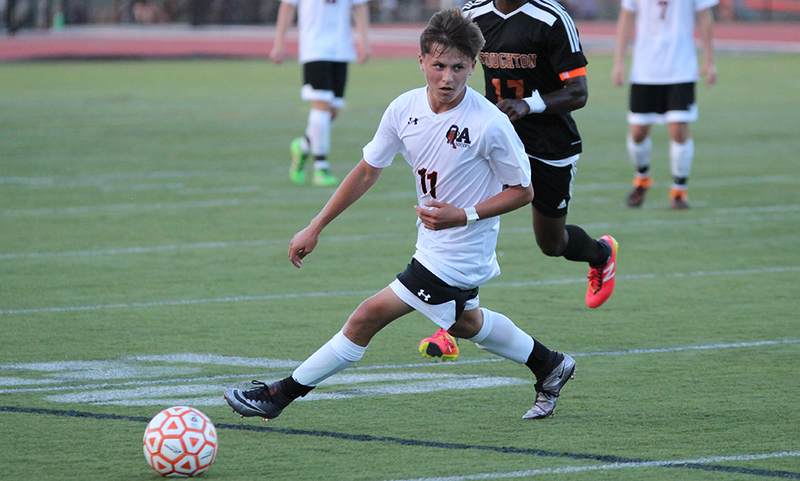 Stoughton boys soccer (2-3, 1-3) is back in action on Wednesday with a trip to Norwood. Milford (1-3, 1-3) will play in the opening game of a double header on Saturday at 5:00 at Canton. STOUGHTON, Mass. 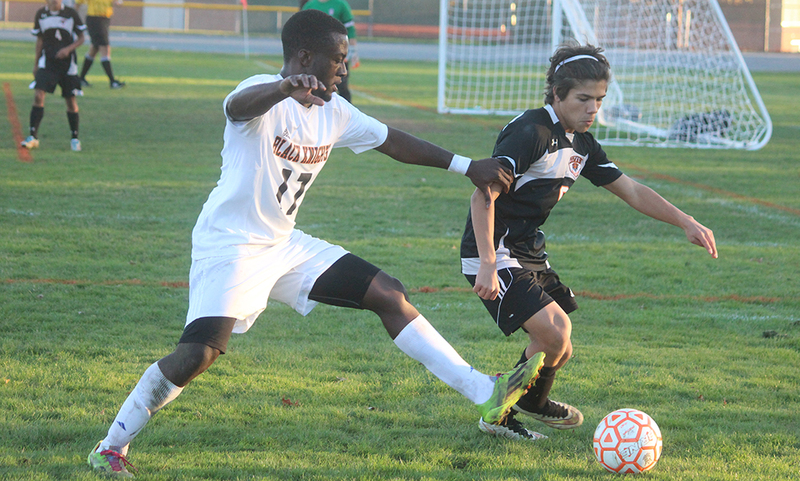 – Stoughton dominated for the majority of the first half but a lack of serious scoring chances sent them into the halftime break knotted in a scoreless game against Diman. That all changed in the early minutes of the second half as the Black Knights found the back of the net less than three minutes into the second half and added another 10 minutes later as Stoughton advanced in the playoffs with a 2-0 win over Diman. In the 43rd minute, senior goalie Kyle Silverman sent a free kick from just outside his own area all the way up field and over the top of the defense. Senior Josh Mitchell chased in after the ball behind the defense and a simple header caught the Diman keeper a little bit off his line and found the back of the net to make it 1-0. Just 10 minutes later, Silverman launched a punt up the right side of the field. Off a bounce, freshman Fabio Ponce de Leon brought the ball down with a terrific touch and outraced his defended to the end line. 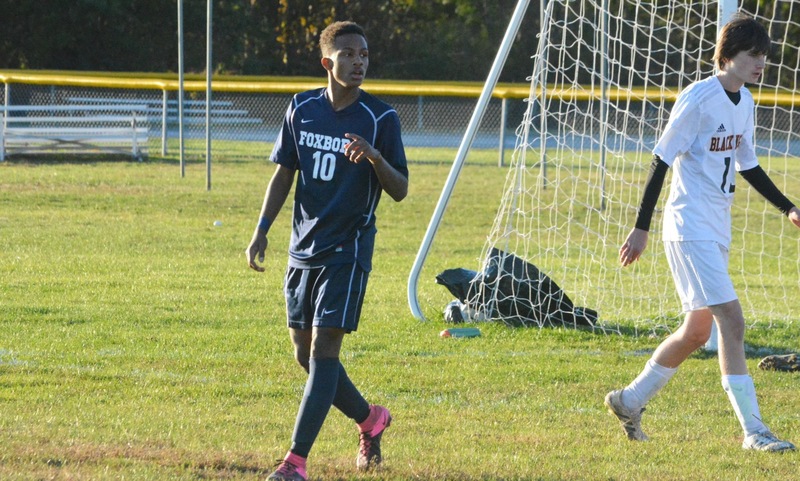 The first year midfielder then centered the ball with a cross that deflected off a defender and right to the feet of Loubensky Lucas, who calmly buried his chance from 12 yards out to make it 2-0. Stoughton had a couple of chances inside the first 10 minutes but none that tested the Diman keeper. First Mitchell had a chance at the near post in the 2nd minute and then got his head to a cross from Noah Schulze in the 8th minute but both went over the bar. In the 13th minute, Ponce de Leon got his head onto a long throw into the area from Mitchell but it went just wide at the far post. Ponce de Leon nearly opened the scoring in the 17th minute after Lucas took a long clearance and used his speed to get by the defense. His cross was headed by the freshman but a Diman defender was there on the line to clear it out. Diman’s best chance came with just over 20 minutes left in the first half when a ball over the top was run onto by Dominic Rocha but Silverman came charging out and Rocha’s bid sailed over the bar. In between goals in the second half, Mitchell nearly had a second when he took a free kick quickly but it was just over the bar. The visitors’ lone chance of the second half came just over midway through the period when Alex Moura played a ball wide for Brian Carreiro, who served a tempting ball into the area but Silverman came off his line to punch it away. The game was delayed for a lengthy amount of time with just over two minutes two play when a collision between a Stoughton player and Diman’s keeper resulted in an injury. Diman’s goalie was forced to be taken off in an ambulance. Junior Matt Gallagher nearly made it 3-0 with a minute left, getting his head on a corner from Jordan Asnes, but Diman’s backup keeper did well to stop the chance. Stoughton will now travel to #2 Greater New Bedford (17-1) on Friday with kickoff set for 6:00.